Yes, it's still August. However, companies are already promoting the Pumpkin season and it makes me so excited! 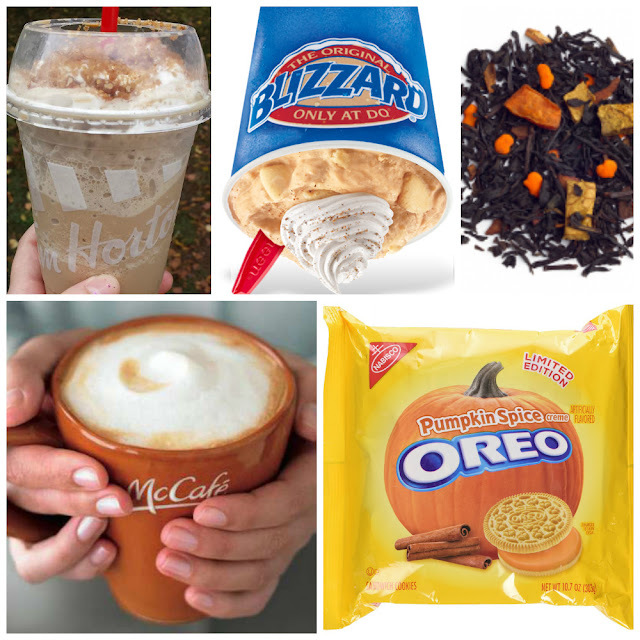 Starting next week I'll be able to drink weekly pumpkin spice lattes and look for pumpkin treats in the grocery store (Canada has a pathetic selection in comparison to the U.S. though). I know new items will pop up this year but these are my favourite pumpkin treats that I'm looking forward to. 1. Tim Horton's Pumpkin Pie Iced Capp. It came out last year and I only had the one but it was really good. I've noticed it popping up on U.S. friends' instagrams so I'm assuming it'll be showing up at Canadian locations again. 2. Pumpkin Pie Blizzard at Dairy Queen. This has been coming out year after year for as long as I can remember and it's one of my favourite things! The graham cracker bits throughout the blizzard are perfect. 3. Pumpkin Chai tea from Davids Tea. I've said it again and again, but this is one of my favourite teas. Pumpkin spice and chai are the perfect combination. 5. McDonald's Pumpkin Spice Latte. I like it better than Starbucks' version. It's less sweet and more spicy. I will be consuming this pumpkin treat the most during the upcoming months. I also really like the Pumpkin Pie Pop Tarts and Pumpkin Spice M&Ms but these aren't available in Canada and I've only been able to try them a couple times. What are you favourite pumpkin treats? I don't think I can pick a favorite. My favorite Pumpkin Spice Latte though is from Panaera Bread! I like it better than Starbucks! I just grabbed a bunch of those Oreos on Sunday and I'm almost all the way through the package. Yikes!